Apple has been creating iconic commercials that make their product’s stand out for as long as I can remember. Whether it was the high-energy, dancing silhouette campaign for the iPod, or the dad joke style of humor in the Mac vs PC ads, I always saw Apple as having an entertaining and engaging marketing strategy. In their latest holiday ad titled “Sway”, Apple avoids showcasing their latest product and instead creates an emotional narrative through movement and music. The ad starts with a young woman walking down a snowy street in the middle of the day, surrounded by the busy noise of city life. Once she puts in her AirPods and presses play on her iPhone however, the scene transforms; it becomes night time and she dances around the street with a spotlight on her, engulfed in the soft piano and clear voice of Sam Smith’s “Palace”. While other people on the street go about their business as usual, the young woman dances freely. She is lost in her own world of music until she spins into the arms of a young man passing by. The contact forces a sudden shift back to reality, however the music and dancing resumes when she hands him one of her AirPods. The man and woman seem to float as they dance together throughout the snowy city, their intimate movements perfectly illustrating the narrative of love in the song. As they move in close for a kiss, the scene jumps back to reality, showing the man and woman had never moved from the spot that she fell into his arms. As they both walk away smiling, “move someone this holiday” displays on the screen. 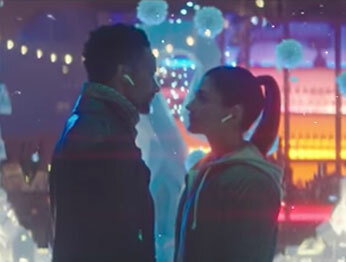 In the advertisement, the woman is able to escape reality and dance freely in her own world because she connects with her iPhone and it gives her the power to be herself; this message symbolizes the strong positive association Apple’s customers have with the company and their wide range of products. A brand that can interact with its audience and move them emotionally can leave a strong, lasting impression that benefits both parties. For the customer, they feel that the company relates to them and is selling the lifestyle of a product rather than the product itself. For the company, they create a bond and an emotional response from their customer, which can establish a lasting business relationship in the future. As a business owner, it’s important to consider the connection your brand has with your customer and the impression you leave on them from the marketing you create. If your ads only focus on the latest and greatest features of your product, customers might not feel an emotional pull towards the message you are trying to send. Apple’s “Sway” is a refreshing example of an ad that focuses less on the product’s specific features and more on the message of connecting with others in some form. While this may not be an ad that gets fondly remembered like the dancing silhouette campaign of the past, “Sway” is the perfect example of a quiet ad that speaks loudly. Your brand should strive to move others.